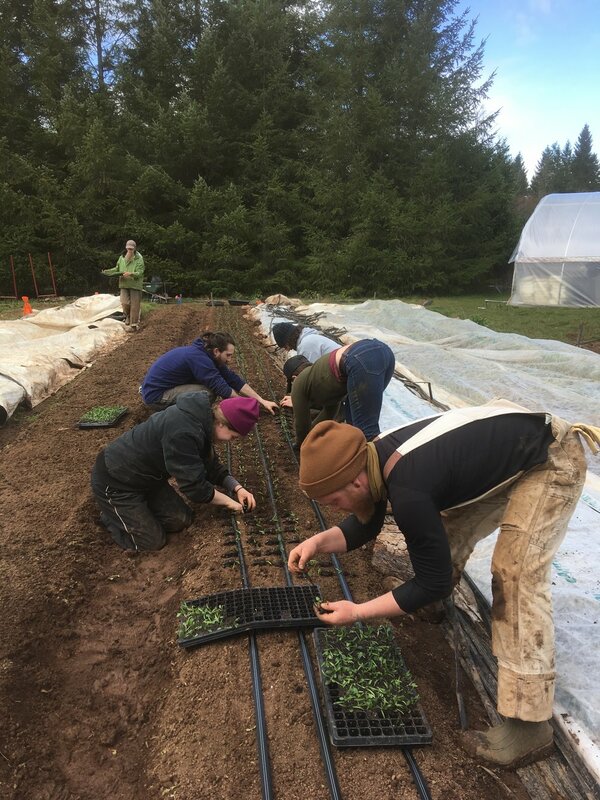 A hands-on apprenticeship focusing on small scale, bio-intensive, market farming in the Pacific Northwest. (2019 Season is in full swing! We are no longer accepting applications for this season). Mondays and Thursdays from 8am - 5pm at Blue Raven Farm in Corbett, OR. Farm tours and classroom component in partnership with Rogue Farm Corps (this component took place approximately twice per month on Sundays for the 2018 season). Details for the 2019 field-trip and classroom schedule will be solidified in early 2020. Tuition cost of $2500 includes over 650 hours of field training, a CSA share (valued at over $600.00) and weekend farm tours and classroom sessions with farmers from all over the Portland Metro region. $500 deposit will hold your spot in the program upon acceptance. Quarterly payments for remainder of tuition available. Jen Aron: Lead Instructor and Farm Manager for Bridge City Farm School. I got my start in the Portland urban farming scene in 2009 and have been honing my craft as a farmer, teacher, and mentor ever since. I love to teach and I love to farm, plain and simple. I specialize in breaking down the complexities of horticulture into a digestible and fun learning experience. I am passionate about soil biology, beneficial insects and pollinators, and I love helping folks reconnect to soil, the seasons, and the food they eat. I was the lead instructor for the Beginning Urban Farmer Apprenticeship (BUFA) program for OSU Extension for the seven years the program ran in Portland, OR. I helped train over 125 aspiring farmers before our funding was lost in 2017. In addition to my work with the BUFA program and OSU Extension, I have taught for various organizations through the years: Rogue Farm Corps, Portland State University, Metro, The City of Portland, Zenger Farm, OSU Master Gardeners, Growing Gardens, and Coffee Creek Correctional Facility. Farming is one of the most arduous vocations there is- both mentally and physically. Farming takes a lifetime to master, which can be frustrating for the beginning farmer. Biology, chemistry, botany, and entomology are just a few of the sciences needed to help foster a deep understanding in the connection between plants and soil. I help weave these lessons into fun, approachable, hands on experiences that will leave you with a solid understanding of what it takes to be a successful farmer. Bridge City Farm School is located at Blue Raven Farm on 5 gorgeous acres in Corbett, Oregon just 40 minutes outside of Portland. Our educational farm is home to a 3/4 acre orchard, two bee hives, 30+ laying hens, and 3/4 acre in annual row crop production, for a total of 1.5 acres in production. We sell our produce through Community Supported Agriculture (CSA) memberships and restaurants. We like to say our produce is "ecologically grown". Caring for the soil is at the forefront of all of our farm management decisions. We do not use harsh herbicides or insecticides (organic, or otherwise) that are hard on the soil and beneficial insects. We are a no-till farm, which means we disturb the soil as little as possible, fostering strong soil soil biology and tilth. Jen Aron has tremendous capacity to work with students in a meaningful way, meeting them where they are at, and facilitation life-changing experiences to help students grapple with the opportunities and challenges of farming. Jen also helps students navigate the personal and interpersonal challenges associated with season-long, cohort-based learning. She provides a realistic view of the rewards and challenges of this lifestyle choice and helps students identify next steps for their own learning and career path. Jen’s positive attitude and desire to learn from nature are remarkable, helping students to develop the right mind set for a future in the field, so to speak. She is both an instructor and mentor for students in farming and in life, in general. Bridge City Farm School is based on the season-long and hands-on educational format that we developed through BUFA. I am excited for future students to participate in season-long learning adventures with Jen Aron. If you are looking for a rich and fun learning experience to develop your foundation for a future in farming, consider spending a season with Jen Aron at Bridge City Farm School". -Karen, Our Table Cooperative- Farm Manager. I want to express the tremendous amount of gratitude I have for you. Your positive energy, consistent hard work, managerial finesse, and sense of humor made working with you and learning from you a true pleasure. To this day I look up to you as one of my farmer role models…. “Passionate, meticulous, intimately connected to the earth, engaged, knowledgeable, proud, committed to growing plants and relationships, involved, deeply interconnected, selfless… Jen’s passion for farming and engaging new farmers in the deeply interconnected associations we have with the earth and for growing food is extremely inspiring. She makes you proud to be a farmer and feel a sense of commitment to making this world a better place, one carrot at a time. Her knowledge becomes your knowledge due to her willingness to involve anyone in the learning process, creating symbiotic relationships between not only plants but us as well. She is a great mentor, land steward, farmer, and teacher". “Jen’s personality helped to make her one of my favorite instructors of all-time! She is understanding, extremely knowledgeable, very patient, and very passionate about helping people discover how exactly they want to connect to food. 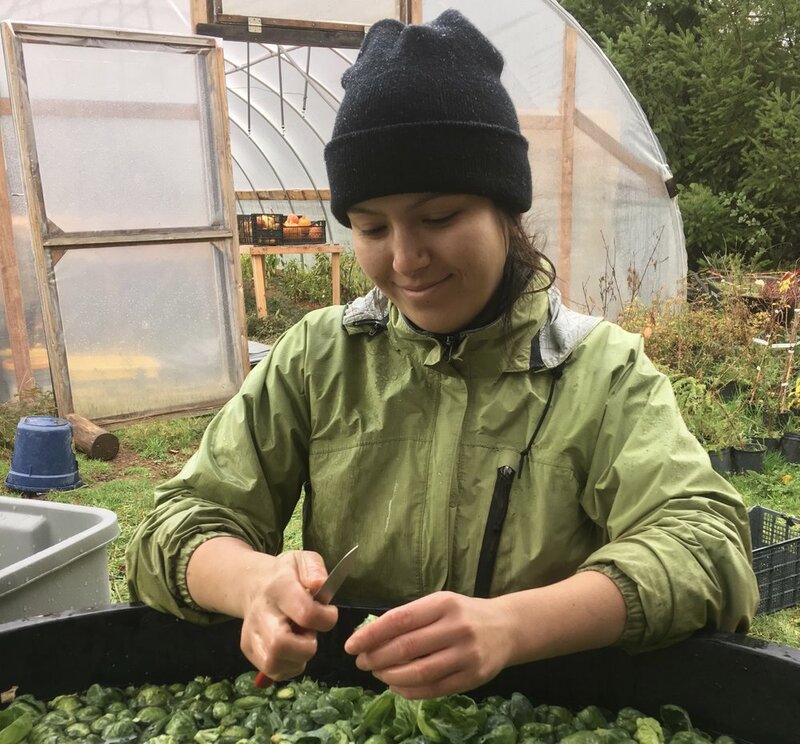 Her honesty and down-to-earth nature, coupled with her desire to teach with the seasons and eat delicious fresh food makes her the perfect instructor for contextual and experiential farm education. Jen is also incredibly discerning when it comes to working with different learning styles, and can adjust accordingly– making her easily adaptable and approachable. The strong work ethic she displays on a daily basis models her leadership abilities and was very affirming to me a student of hers. I also appreciate her willingness to tackle any question, no matter how technical or specific. Jen’s commitment to my education helped me to identify what I wanted from being a farmer, who I wanted to sell to, and how much work it all took. It is the skills I took away from her market farming instruction that have given me the perspective to start my own small farm". "Good farming incorporates dedication, pragmatism, mysticism, humility, physical endurance and a healthy dose of realism. Jen Aron models this and mentors you on all of the fine details of finding your way to a career in farming that you can sustain and that can sustain you. Prepare to be transformed, and don’t forget your pad and pen. From propagation and greenhouse management, to crop selection, crop-specific cultivation techniques, food-safety and body mechanics best-practices, the learning is there for those who are ready to work, to ask questions, to listen, and take notes. Jen takes care to give compassionate constructive feedback, to guide good group process, and to know you as a learner". Luke Maurer, Portland State University, Learning Garden Labs site manager.